Σε πολύ καλή τοποθεσία της Τζακάρτα, το Liberty Hotel Jakarta Thamrin είναι μια πολύ καλή βάση απ'όπου μπορείτε να εξερευνήσετε την σφύζουσα πόλη. Από εδώ, οι επισκέπτες μπορούν να έχουν άμεση πρόσβαση σε όλα όσα η πόλη έχει να προσφέρει. Με την βολική του τοποθεσία, το ξενοδοχείο προσφέρει εύκολη πρόσβαση στους προορισμούς της πόλης που πρέπει οπωσδήποτε να δείτε. Επωφεληθείτε από ένα πλήθος ασυναγώνιστων υπηρεσιών και ανέσεων σε αυτό το ξενοδοχείο της Τζακάρτα. Κορυφαία χαρακτηριστικά του ξενοδοχείου συμπεριλαμβάνουν τα δωρεάν WiFi σε όλα τα δωμάτια, 24ωρη φύλαξη, ημερήσιος καθαρισμός, προσβάσιμο με αναπηρικό καροτσάκι, 24ωρη ρεσεψιόν. Τα δωμάτια του ξενοδοχείου έχουν διαμορφωθεί προσεκτικά ώστε να παρέχουν υψηλό επίπεδο άνεσης και την ευκολίας. Σε κάποια από τα δωμάτια, οι επισκέπτες μπορούν να βρουν επίπεδη τηλεόραση, κρεμάστρα ρούχων, δωρεάν καφές φίλτρου, λευκά είδη, καθρέφτης. Εξάλλου, το ξενοδοχείο διοργανώνει πολλά ψυχαγωγικά δρώμενα έτσι ώστε να έχετε πολλά πράγματα να κάνετε κατά τη διαμονή σας. Έξοχες υπηρεσίες και μια εξαιρετική τοποθεσία κάνουν το Liberty Hotel Jakarta Thamrin την ιδανική βάση από όπου θα απολαύσετε την παραμονή σας στη Τζακάρτα. Σε αυτήν την ιδιοκτησία απαγορεύεται αυστηρά το κάπνισμα. The hotel is in good location. Can go by AIRPORT LINK and just walk a bit and also can walk to GRAND INDONESIA easy and near. Or if you hungry in the working day you can find minimart and also many restaurant in basement of UOB PLAZA nearby only walk 5 minutes. I choose to stay here because the review is good. But a bit make me angry when check in. I am check in around 14:15 (its the normal time for check in) and they let me wait until almost 30 minutes. Then i told them i have the traveling time from Overseas since 4 am and face to traffic jam at jkt to reach hotel.The hotel should not let the guess wait too long time like this. and also they request for deposit 300K Rp. Its quite high. (room without minibar) But once already at room. Wow.. Its good and spacious. and make my temperature of angry going down. I have enjoy with the room so much. BED, TV, AIRCON, BATHROOMS all is good and clean Why mydeposit amout still not clear in the system credit card. Please delete it ASAP! This is a new hotel. We happy with our stay with good location in the middle of town,nearby shopping mall and great customer service from RECEPTION, MR DANU which assist us during our stay,he very kind and polite. The security guard also very helpful. Definately will stay here when we back in Jakarta. Stayed at Liberty for 4 days and 3 nights. The hotel staff are very helpful and friendly, from reception, café and the concierge especially to Rispi (cannot remember the other 2 guys name) and also Danu Reception. Rooms were clean and bed and pillow were very comfortable. Went around Jakarta by Grab and taxi. Shopping centre Grand Indonesia is 5 mins walk. The location is very convenient. The staff gave us longer checkout time of 7pm. The room was clean. Aircon was cool. The breakfast buffet was delicious and very cheap. Recommended for first timers in Jakarta. The only good thing about the hotel was the location. It was very convenient to get to the textile market and walkable to all the big malls but the room I had was so uncleaned. Dirt and sands all over my floor when I checked-in to the room. But I was too tired so I did not complained and just went off to sleep. The registration counter staff wasn't that friendly. Hardly see a smile on their faces. But the coffee and the barista was all good! Well, at least that makes me happy. I have stayed at several boutique hotels in Jakarta and I can assure that this hotel is one of the best. Counter staff were friendly and attentive. The room I had was spacious as compared to other hotels in the same category and the bed and pillows were AMAZING. Walking distance to Grand Indonesia mall and train station (airport express) is a plus. I would definitely recommend you this hotel! The hotel was clean, staff were very nice, and food was good. This place is also very well located nearby airport train station and Sudirman station. 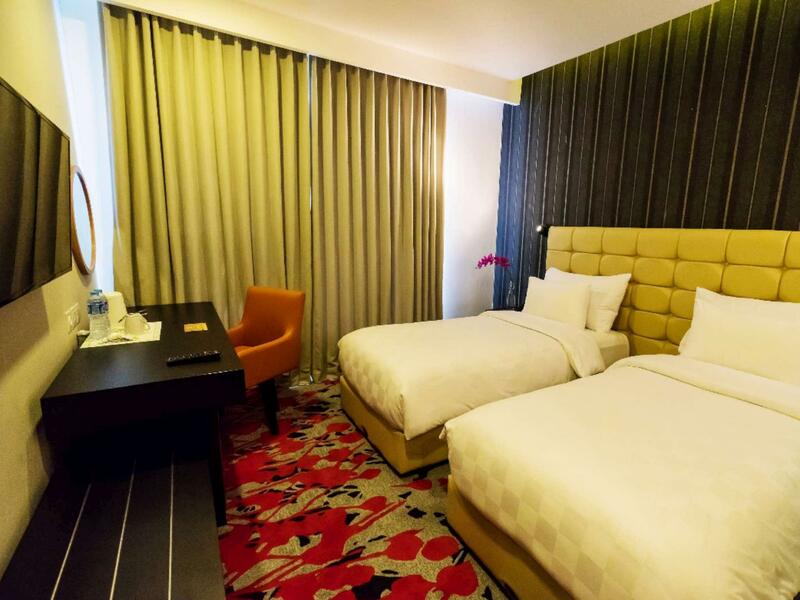 Close to Thamrin and Sudirman area so it's a very good choice for business travelers. Stayed for 3 nights here. Rooms were clean, beds are comfortable, decent breakfast, helpful staff & value for money. But location makes it hard to access from major roads, have to go via minor roads/streets. 4/5 stars. As stated in the previous reviews, this hotel offers you a pleasant stay. I booked for 4 rooms with extra bed. We love the room, the toilet was clean and the toiletries were well equipped and it smells good, the bed was comfortable, and all the staff was friendly and helpful. The breakfast provided was fine. One and only thing that you need to worry was the wifi connection. Poor signal but as for me, it won’t be a problem if you have pocket wifi or roaming your data for your stay. Recommended! Very well appointed rooms for this price bracket. Very new hotel so very fresh and clean. Super comfortable bed, very efficient quiet AC, nice bathroom with great shower, tea & coffee making facilities. Friendly, helpful staff Just does not really have suitable communal areas for friends to gather. 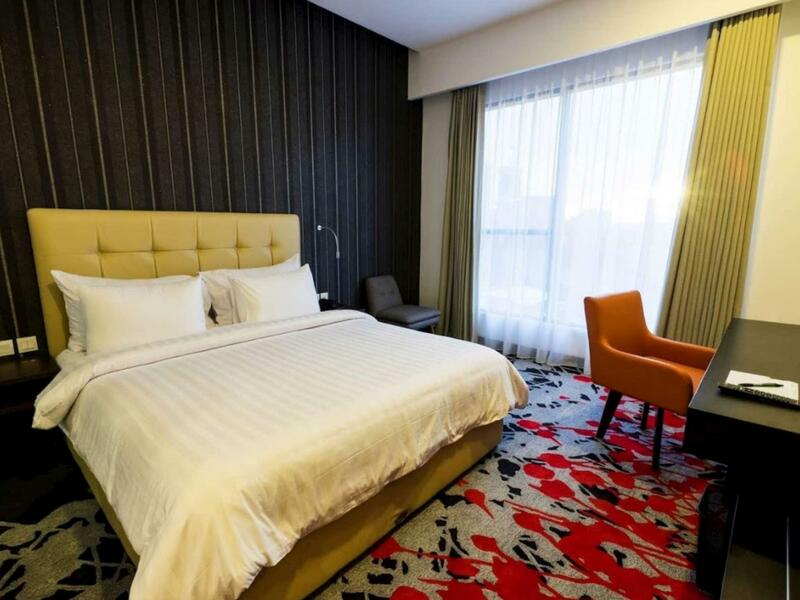 If you plan to use the newly opened Soekarno–Hatta Airport Rail Link Service to reach Central Jakarta City, this is one of the best hotels to stay in. Just alight and exit at the BNI City Station / Stasiun Sudirman Baru, take a short stroll (6-10 minutes) through a safe and serene neighborhood, and you arrive at this urban oasis called Liberty Hotel. Take another short walk further, and you are ready for meetings and visits in various financial, commercial, recreational and tourist destinations around Thamrin City. Yes, just walk and avoid the motorists traffic jams. Excellent location. Pros: - Location: Centralised and easy to get to anywhere. Just a short walk from the airport train station to the BNI City station near the hotel, Grab transport can find the place easily and arrive fast. Short walk to Grand Indonesia and onto Thamrin City. Feels safe to be walking at night from the train station although quiet. 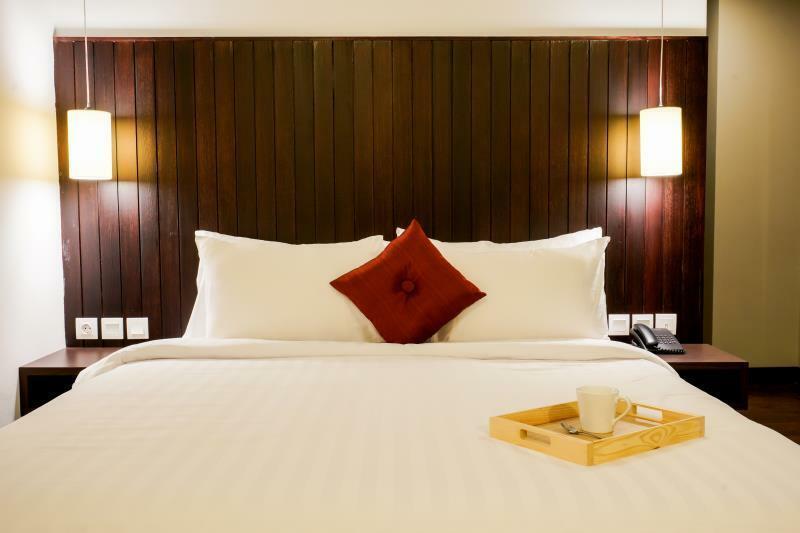 - Room: Clean, spacious, comfortable bed and pillows. - Amenities: Good water pressure and warm water supply when needed, strong aircond, great tv channel selections. Cons: - Staffs: Although polite, they don't appear friendly and not knowledgeable when asked about recommendations on food, supermarket, etc. - Bathroom: The bathroom and bedroom are separated by glass wall and the blinds don't give complete privacy with about 2 cm gaps on the sides. I can definitely see the bed clearly. Might be an issue for people who are not travelling as a couple. - Amenities: Lousy hair dryer and breakfast is 70K with limited choices. Should have more breakfast varities. Σιδηροδρομικός Σταθμός Sudirman στα 0.3 χλμ.